I've missed more than 9,000 shots in my career. I've lost almost 300 games. Twenty-six times I've been trusted to take the game-winning shot and missed. I've failed over and over and over again in my life — and that is why I succeed. You are currently browsing the Meranda Writes weblog archives for the day Sunday, June 7th, 2009. For most daily stories, the time it would take me to outline the article isn’t worth it. I can write about a crash, a fire, a school board meeting without really thinking through the direction I want to head: Start with what happened, and it gets less important from there. But I also write a lot of daily enterprise. When I’m working on these stories, I’ve found having a direction saves me time. It’s worth the five minutes to outline a story if it saves me 20 minutes of trying to just get started. The usefulness of outlining stories is almost directly related to the length of time I’ve been reporting and how much information I’ve gathered. Sometimes, a story just comes to me and flows without much effort. Other times, I’ve reported so much I’m overwhelmed by everything I’ve gathered. Deciding what to include, or not include, and what I need to do more research on, and then, how to arrange all of that information can put me at a deadlock, as I was on Friday, when I was writing two A1 stories for the weekend papers and had been working on one for an hour but had just two paragraphs written. I’ve talked to my editor before about this, and he suggested the way he writes is to do each chunk as he reports it. That’s a great idea. I’ve tried it — with limited success. I know some reporters have to have the perfect lede before they write the second paragraph. I can write a bad lede just to get me started and come back when the first draft is done. My problem is I need to be able to see where it’s going before I start writing. I need to have everything reported and ready to be compiled. That’s why outlining a story works for me. On Friday, in an effort to get the stories written, did just that. I posted a picture of my “outline” on Twitter. Kate Martin commented on it, which made me realize, this might be a method worth sharing with the wider community. Gather all the story notes. I flip to the pages in my notebook(s) if they’re written or print the document off the computer if they’re typed or transcribed. Highlight the facts you want to include. I also highlight and star the quotes I like. I use different color highlighters for each person/source to make it easy to identify quickly who is speaking and where the info came from. Write each of those ideas/facts/quotes on a Post-it. I don’t write the whole thing out just the general point and who said it/where it came from so I know where to quickly find it in my notes. (Remember, those are color coded.) You also could probably just as easily do this on the computer, in a Google Notebook like program. But I find taking a break from staring at the screen helps me process the information better. Note: I cut up a regular size Post-it into about four flags each to be less wasteful. I’m actually not wasting office supplies anyway. I usually buy my own Post-it notes because I don’t like the plain-vanilla yellow in that shot. Group related topics/information/quotes together. I usually do this on my desk, or if your desk isn’t cleared enough, a sheet of paper works well. Usually at this stage, I can eliminate duplicate or tangential information pretty quickly: I can tell the areas I have the most information on and those I don’t have enough. If I don’t have enough and it’s important, I know it’s time to do some follow-up reporting. Within the group, arrange the information. This is what my boss does when he writes chunks. You’re just putting the information together in a logical sequence, and again cutting things that don’t fit or need to be there. Arrange the groups. At this point, I pull out the anecdote or fact I want to lead with and/or those I want to end the story with. (In my example above, I had just written a place-holder “Lead ?? ?” at first because I didn’t know yet how to start.) Then, I put each group down in a sequence that makes sense for the direction of the story. Re-arrange the groups or the facts within the group. I add back in anything I took out that feels like it’s missing. Or I take out anything that feels unnecessary. This is the entire point of using Post-its, which you can quickly and easily reconfigure. Write. 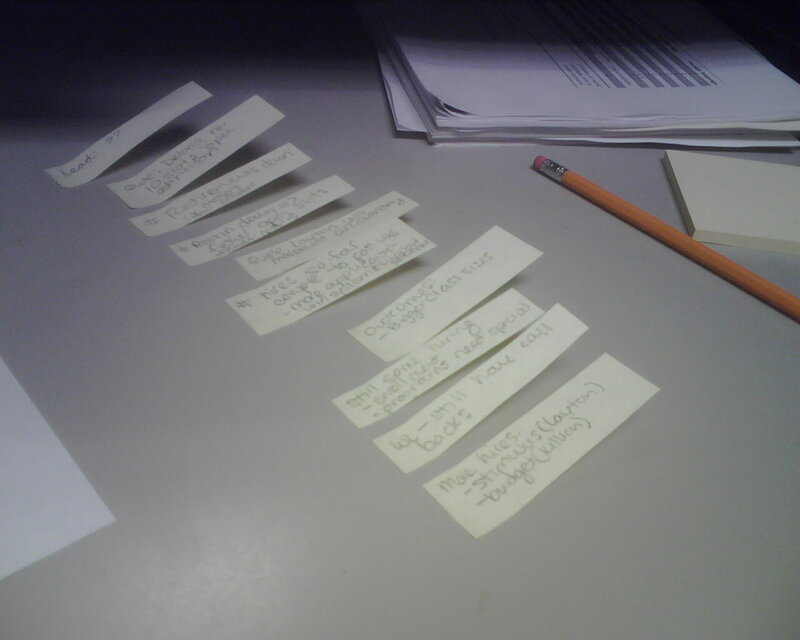 Organizing the story was the hard part, so once I have that figured out, I can just write through by filling out the full quotes and facts I abbreviated on my Post-it notes. Read and rewrite. Once the story is written, I go back through at least once more. Read it, proof it, clean it up, double check the names and numbers, clarify anything that needs more explanation. File the story. And move on to the inevitable next story. After I outlined my story Friday, I finished writing all 23 inches in 20 minutes. Do you have any suggestions to improve my method? Or better tips to try to improve organization/writing? Let me know. I’m definitely game for suggestions to make me write better and more efficiently.